June Lake has small-town-y charms and those huge, huge peaks. View some awe-mazing snow-capped peaks in pretty June Lake. "THE SWITZERLAND OF CALIFORNIA"... and one glance up at Carson Peak tells the full story. It's a straight-up, ridges-galore kind of sight, one that is Alps-y in its enormity but, of course, is pure Sierra grandeur. Other peaks in the June Lake vicinity offer the same sort of breath-taking-ness, with spots like Silver Lake adding foreground beauty to the not-too-distant mountains. So what's to do in The Switzerland of California when winter pulls into town, and all of the snow-capped gorgeousness? 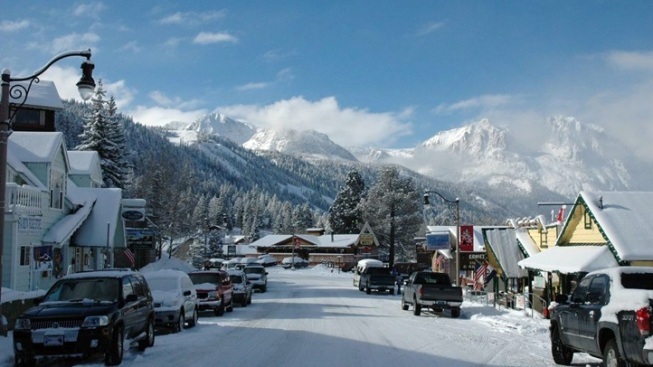 A solid starting place is the Mono County tourism page, which details wintry activities like snowshoeing, cross-country skiing, and more. Swinging by the online HQ for the June Lake Loop can also give a peek at the peaks and all of the nearby fun times that go down when the snowflakes are falling.